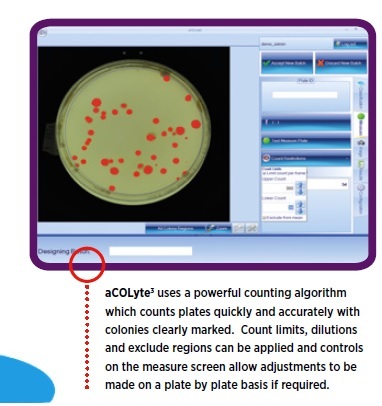 aCOLyte 3 HD is the latest affordable, automated colony counting device from Synbiosis. The aCOLyte 3 HD is available in one configuration and features new simple-to-use software that greatly improves efficiency, reliability and productivity over previous models. The new aCOLyte 3 HD software uses a powerful new algorithm for colony counting on pour and spiral plates which until now were only found on the advanced ProtoCOL 3 models. 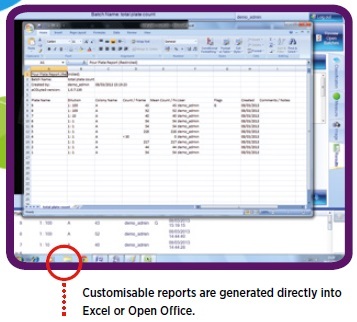 Plates are automatically counted with results directly transferred to Excel or Open office. The new style aCOLyte 3 HD accepts plates up to 90mm diameter. Lighting is provided by LEDs mounted above and below the sample area for both transmitted and epi illumination. A detachable screen can be used to eliminate strong ambient light if required. aCOLyte 3 HD can be used with any conforming laptop or desktop PC and connects simply by using a USB port. aCOLyte 3 HD can be used for total viable counts in many environmental, food monitoring, pharmaceutical, clinical, and molecular biology applications. E.coli, Enterococcus faecalis, Salmonella spp, and mixed organisms on plate count or nutrient agar. Staphylococcus aureus, and mixed organisms on plate count agar, columbia blood agar, or nutrient agar. E.coli on LB medium, and yeast on potato dextrose agar.